Messy Monday: Wrap It Up Right Away! Black Friday: Did You Do It? Recipe for Christmas Joy E-book Winner! A Recipe for Christmas Joy Giveaway! Messy Monday: What is Clean? The appetite of a growing child knows no end. The more active children are, the more calories they burn, and the more often they need to refuel; consequently, the more often we need to feed their hungry tummies. For me, it often seems like I just finish cleaning up one meal, when there my boys are, in the kitchen, wanting something to eat again. If we could make a whole bunch of healthy snacks ahead of time so they were all ready to go when we needed them, this would be a great source of mercy in our lives! -In a large bowl, combine dry ingredients. Drizzle oil over mixture, cut in with pastry blender, fork or fingers until it resembles coarse cornmeal. Store in covered container in refrigerator. Keeps about 3 months. You can use it to make breadsticks, muffins, pancakes, cobblers, tortillas and much more in a cinch. Mix dry ingredients. Add water to form dough. Knead 12 times. Shape into pencil like strands, 1/2" thick. Cut into three inch lengths (or whatever you want.) Roll in sesame seeds if desired. Bake on ungreased cookie sheet at 400-degrees F for 20 minutes or until brown. Combine mix and water. Blend egg and water, add to mix. Stir gently until dry ingredients are moistened. Fill well-greased muffin pans 2/3 way full. 400-degree F for 20 minutes. Makes 1 dozen (a little bland but not too bad). Combine berries, sugar and egg in a greased baking dish or 8 x 8 pan. Combine mix, sugar, oil and water in mixing bowl. Spread over berries. 400- for 30 minutes. Combine mix and sugar. With fork, blend in rest of ingredients. Shape dough into two logs about 1-1/2 inches in diameter. Wrap logs in waxed paper and refrigerate until firm or until needed. Cut into slices 1/4" thick and place on ungreased cookie sheet. 375 for 10-12 minutes. 3-4 dozen cookies. What snacks do you like to make in large quantities? I'd love for you to share your own ideas about this topic, or any other about bulk steps to ease meal-prep! (Having some problems getting the link widget...for now, go ahead and use the comment section, and I'll keep trying to get it to work). Once-a-Month, Once-a-Month Cooking Festival Almost Here! Last month, we kicked off the once-a-month, once-a-month cooking festival here at Moms In Need of Mercy, where we shared any tips we've learned about how to streamline meal prep. I appreciated reading your ideas and insight! I would love for you to share again! So our next installment of the once-a-month cooking fest will be Tuesday, December 1st. I would love for you to write a post about anything you do now so that you can have meals or snacks ready to go when you need them later. Then come back Tuesday and link up! (You can use an old post too if you want). I think I'll focus on snacks in bulk quantities this time around. I'm looking forward to hearing your ideas too! Instead of spending all of Christmas Eve relaxing with my family after our evening church service, I've spent many an Eve wrapping gifts 'til the wee hours of the morning. This year, I am making a plan so the unwrapped gifts don't pile up. Last week, I wrote about preventing piles in the first place. Following those principles, my new guideline is: wrap it right away. Sounds so simple, doesn't it?! I'm aiming to take a little bit of time each day to wrap gifts as I get them. That way, gifts will get wrapped a little at a time, and I won't find I vastly underestimated how much I had left to do on Christmas Eve. So this week, I'll spend a few minutes each day wrapping the presents I already have around the house. This past weekend, when I went to a few Black Friday sales, as soon as I got home (or thereabouts), I went downstairs to my wrapping station (my husband is laughing at me for calling it a "wrapping station"--it's just our spare bed, but it's right at my level, and everything has plenty of room to stretch out on it). :) I wrapped up my kids' new toys and my husband's gift, and put the wrapped presents away neatly in a special hiding spot (not under the tree yet, because a certain one-year-old and two-year-old would have them unwrapped in seconds!). If I keep this system up, I just might be able to actually open a few gifts on Christmas Eve! On a related but slightly different note, I read Laura's post about a pre-Christmas purge of toys and books. I think it's a great idea to make room for the incoming items, but I have such a hard time figuring out what to send out. Just when I think my kids are done playing with something, that's the very thing they go for. If you do the purge, how do you decide what goes? This week I am going to try to save money by not going to the store, so I'm planning around what I already have on hand. I think it looks pretty doable after all! I don't know exactly what it was that made us do it. 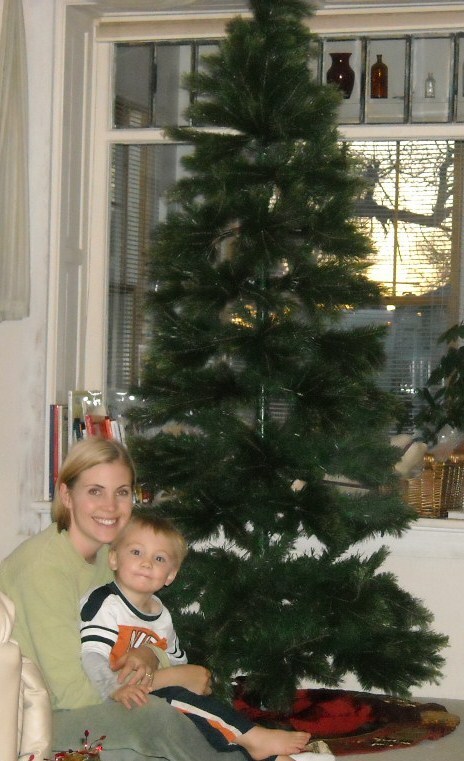 Maybe the fact that the last few years, the boys seem to get these colds that don't go away until we take down the Christmas tree (my friend's pediatrician told her that real trees in the house can exacerbate allergies). Maybe it was because little kids and real trees don't mix that well (playing in the tree water, pulling at the needles...). Maybe it was because buying a new tree each year starts to get expensive after awhile. Then there was the fact that I wanted to put a tree up today but my husband has the flu, so I knew the whole going-out-to-find-the-perfect-tree bit wouldn't work. Combine that with my $20 (rounded up) credit at the Salvation Army, and it was enough to drive me to the edge. I drove to the Salvation Army in search of the perfect artificial, secondhand Christmas tree. Before I left, my husband's parting words to me were "Make sure it doesn't smell like moth balls or cat pee" (exact quote). Once inside, I was overwhelmed with the selection (ok, not exactly). But there were quite a few to choose from. I quickly ruled out those that did not meet my husband's strict criteria, and I was left with two nice choices. Both were 7.5 feet; one was a spruce, and one said "Arcadian Cashmere" (I don't really know what that is, but it looked elegant in the box). Being from Michigan, the spruce was what I envision when I think of "Christmas tree." Being from Wyoming, the thinner, more "see-through" tree is what my husband envisions. With that, we have a problem. Ok, so I know you're dying to hear what I decided. (Oh, you're not? Well, let's pretend anyway) :). Christmas trees have kind of become status symbols. The better off you are, the bigger and fuller your tree (usually). Giant trees are very grand and awe-inspiring, but plunking one down in your living room takes an equally awe-inspiring amount of cash. This little humble tree from the Salvation Army helps me remember that it is in humility Christ came to earth as an infant. It is humility in us He esteems. The tree, as with all our decorations, should point to Him, not to us. Humility reminds us to gulp our pride down. That is why this is the perfect tree for me. It is for this tree, and the lessons from it, that I am grateful. While I did wake up at 5AM, I did not get out of bed at 5 AM, and I did not go to the stores at 5 AM; but I hear thousands of people did. I ran over to Walmart and Target at a more reasonable shopping hour of 8. I still found what I was looking for (a few toys for the kids), and I even saved a few dollars. The cashier at Target told me the checkout line at 5 wrapped all the way around the store! Those were some serious shoppers. Why would anyone do that? I would actually pay to not stand in a line like that. So while they say the early bird gets the worm, sometimes the straggler bird can still find plenty of good worms too...and there's more room to peck around. Do you take advantage of Black Friday savings? Do you go super early? I'd love to hear your reasons for going (or staying home) and what you think about it all! Thanksgiving dinners traditionally involve elaborate table settings to make the feast special and memorable-- an event, rather than just any regular weekday meal. 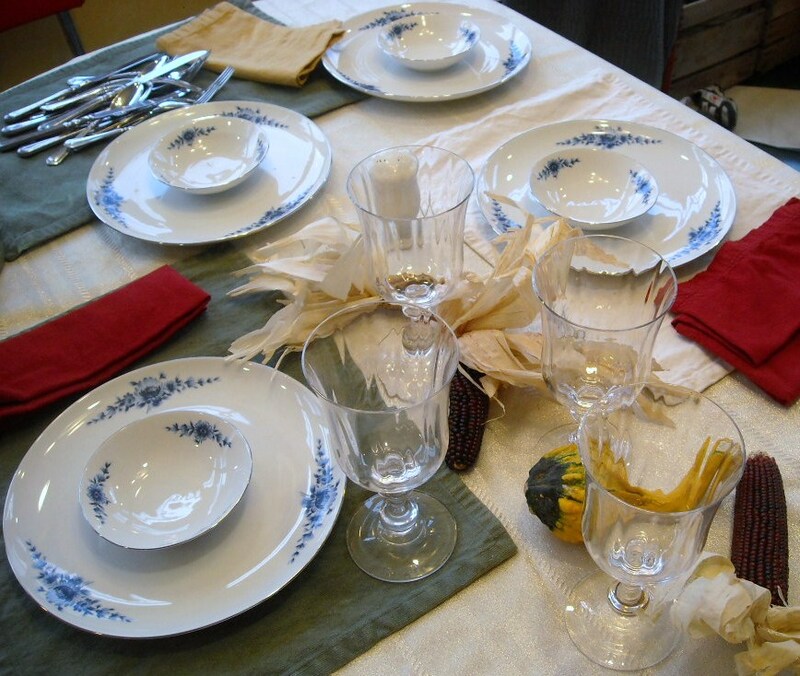 While we can, and probably should, take extra effort to dress up our Thanksgiving table, setting the table nicely shouldn't just happen on special days. Recently a friend told me she always properly sets her table before she has to leave in the afternoon for her coaching position. She shared that this fairly simple step makes a huge difference in her home management. Imagine walking in your house at dinnertime, and the meal is all ready to go in the oven, and the table is already set. Wouldn't that be relaxing? Most nights I am rushing so much to simply get dinner on the table before major-hungry-kid meltdowns that I don't have the time to nicely set my table. Grab a stack of plates, some forks and knives, and some cups, plunk them down in a pile on the table, and announce "Dinner's ready!" After my talk with my friend, and reading this post about tablescapes, I was challenged and encouraged to try to be more intentional about setting a nice table most nights of the week. I don't think there's anything wrong with serving family style (and sometimes in some situations, like with a new baby or illness, we do what we need to just to survive. Paper plates, anyone?). But when there is extra time, how about taking a few extra minutes to make your table look pretty? It's like sending a little message to your family that the meal you worked hard to prepare for them in love is also being served with love. It shows that you esteem them and want them to feel special. "She has prepared her meat and mixed her wine; she has also set her table." I'm curious to hear if you set your table nicely most nights of the week, or if you--like me--feel too rushed sometimes (most times) to go that extra step. If you are consistent about setting the table, I'd love for you to share any tips you've found for how you accomplish it when you're also busy getting dinner on the table. I am excited to announce I cooked my very first turkey this weekend, and it was no small matter, I mean platter. :) The bird was 21.64 pounds (if you wanted an exact number, which I know you did). My step-mother-in-law helped me thaw it the rest of the way, and then I put it in the foil roaster (the cheap-throw-away/save-if-you're-really-frugal kinds from the store) before church Sunday. It was surprisingly easy and extremely delicious. 1. Be sure to allow plenty of thawing time. I thought taking it out of the freezer Thursday to cook Sunday would be ok. Wrong. Wrong. Wrong. The more experienced among us probably know that a turkey that size takes 4-6 days to thaw in the 'frig. 2. When you have underestimated your thawing time, you can speed it up by placing the wrapped turkey in a large sink filled with cold water. A laundry room utility sink works great. Technically, you should change the water every 30 minutes to prevent bacterial growth. When the bird starts to feel fleshy rather than frozen, you can return it to the refrigerator if you have enough time left before D-day, I mean T-day. 4. (I think this step really helped create a moist bird). Once your turkey is clean, inside and out, place the turkey in a bucket of cold water overnight (or for several hours before cooking). I used an extra bulk food storage bucket I had (see the Walmart bakery for their empty icing tubs. They're either free or $1. I can't get to the bottom of it...). From what I've read, this is similar to brining (minus the salt and spices). I found some brining tips here. 5. Now for cooking--I used the tips here, however I modified the cooking temp. I can't in good conscience advise you to cook a turkey at any temperature lower than 325 (wink). I took a nutrition and food safety course through our state university. Quoting from the text, "It's not safe to cook a turkey (or any other meat, for that matter) in an oven set lower than 325-degrees F. That's because it takes too long for the turkey to reach a temperature high enough to kill or limit growth of food-borne bacteria." I brushed the turkey with olive oil, sprinkled it with salt and pepper, added 1/2 c. of water to the bottom of the roasting pan and covered it tightly with foil. Off to church we went. Then when it had cooked at 325 for 4 hours, I uncovered it, turned up the heat to 375, and followed Ree's butter basting tips. I brushed it with butter every 30 minutes. I did this three times, and took the turkey out an hour and a half later (the math adds up...don't you love it when that happens?). I recovered it with foil and let the guy rest after all that hot and tiresome work. Plus, I needed the oven, and he was hogging it. How do you bake your bird??? The winner of Marybeth Whalen's Recipe for Christmas Joy e-book is #12, coursengroup@.... (I did not count my comments in the running obviously!). I will email your email address to Marybeth so she can send you the ebook! Thanks everyone for sharing your thoughts on the 3-present idea. I loved hearing from you! There's spring cleaning and fall cleaning, and then there's a whole 'nother league--cleaning for company. That's when things really go into overdrive around here. Gusto would be the word that would best describe the vigor with which I scrub, wipe, polish, put away, and generally tackle all the areas that have been pining away for my undivided attention. Why do things get this way? The honest truth is because we're busy. It feels easier and quicker (in the short-term) to plop a pile of outgrown clothes in the guest room to be packed away in the right storage tub later than to do the job right, right then. As I was putting away papers and piles (not just transferring them but actually dealing with them) last week, I realized piles would be prevented if I always and immediately put everything where it was supposed to be. Instead, I set something down to put away later. But really I'm just laying it in its grave, because it will stay there until I resurrect it--usually right before the next batch of company comes. So my Messy Monday tip for today is when you feel like you're short on time, so you're just going to plop this _____ (fill in the blank with any object of your choice) down for a few seconds/days/weeks/months until you can deal with a few seconds/days/weeks/months/years later, take a few more seconds to put it where it really should go. Saving yourself some time immediately by laying something down to deal with later always backfires. You'll still have to deal with it. Now or later. Putting it away later will still take as much time as it would had you put it away right away. Actually, it will probably take longer later, because its friends will gather too. You'll enjoy the lead up to company so much more if you don't have to spend so much time calling forth piles from their graves and sending them to their proper places where they can truly rest in peace. You'll have more peace, too, when you don't see unfinished projects and piles standing in the way of a relatively tidy home. If you're with me on this, when you're tempted to just set something down, even just for a second, tell that little voice in your head you better not let it leave your hand until it's where it should go...because otherwise, it will never really make its way to its rightful home until company comes again. My husband's dad and step-mom are visiting this weekend and leaving Monday, so we fast-forwarded Thanksgiving to today. I cooked my first turkey, and it was great! I will write more about that later with helpful links. *Don't worry! I will not serve turkey back-to-back every night this week :) I will probably only end up making two or three of the turkey leftover ideas, depending on what entree sounds best to my family. Place rice on bottom of crockpot and add water. Lay meat on top. Mix together the soup and soup mix. Pour over meat. Cook on high 4 hours (could probably also do low). Cookies of some sort, preferably somewhat healthy, like oatmeal apricot cookies. Especially this time of year, it can easily seem like there are not enough financial resources to meet all the needs. As I've mentioned before, unforeseen medical expenses are gobbling up much of what my husband takes home. Even though I think I'm pretty thrifty, there are still times when I look at the bills and our bank balance and wonder how I can stretch what we have to satisfy all the needs. Then there are times when it still seems that, despite my best stretching efforts, there isn't going to be enough. The disciples felt this way too. A crowd had gathered to hear Jesus teach. It started getting late and people were getting hungry. Aware of what they lacked in resources to feed everyone, and out of concern for the people, the disciples urged Jesus to send them away to the village so they could get some food. Jesus told them they were to feed the people. Hugh? With what? They didn't have enough resources to supply meals for five people, much less for everyone. How could they feed 5,000-plus people with nothing more than five loaves of bread and two fish? That's just impossible. But it wasn't. It still isn't. When faced with a shortfall of finances (or anything, for that matter), give thanks for what you do have--however limited it may seem in your sight. Gratitude helps restore our perspective, and continual trust in God replaces anxiety and uncertainty. Ask God to take your five loaves and two fish and multiply them to feed all your needs. Even when it seems tight, and you don't know on paper how everything will come out clear, do your very best to stretch every dollar, and trust God to stretch those dollars supernaturally as only He can. If He could feed thousands with five loaves and two fish, He is more than able to multiply and expand even the smallest of our efforts. 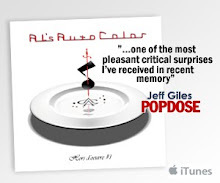 *give-away winner: coursengroup@.... Thanks for participating! A few years ago when I first started reading blogs, I found Marybeth Whalen’s (Cheaper By the Half Dozen) and checked in just about everyday. When she announced her ebook, A Recipe for Christmas Joy, I knew I needed a copy! Knowing how much I love having a book in my hand, my husband even printed it out and spiral-bound it for me. I thoroughly enjoyed (and continue to enjoy) my Recipe for Christmas Joy. From decorations to desserts, it really helped me remember to keep the focus on Christ throughout this season bustling with activity. One of the best take-away ideas in the book was the three present rule, based on the three gifts presented to Jesus by the wise men. “We started this years ago, and I love it! I tell my kids, ‘If it was good enough for Jesus, it is good enough for you!’ Who can argue with that? A good rule of thumb for this is based on the three gifts that Jesus received: gold, frankincense, and myrrh. Gold is the frivolous or fun gift—the big ticket item they have their heart set on. Frankincense symbolized worship, so this is the spiritual growth gift—a Bible, a book on being a godly kid, a Christian video, or something of the sort. And finally, myrrh is the gift that symbolized death—what Jesus was sent to do. This gift is a practical gift around what the child’s bents or talents are. It could be special supplies for an artist or a microphone for a singer, etc. This could also be something practical like an item of clothing. Three items, plus gifts from family members, plus trinkets in their stockings is still far more than what many children in this world will see in their lifetime! • Instead of more junky toys, suggest what I call ‘experience gifts’ from the grandparents. Experience gifts are great because they afford your kids an experience they will never forget-and most times the memories last much longer than the plastic toys that break or get lost. Isn't that a great idea? The three-present rule provided a good rule of thumb for our family, and I hope you’ll be inspired to adopt (or adapt) it for your family too. As I wrote yesterday, fewer gifts means we’ll most likely cherish what we are given more than if we received multiple gifts. 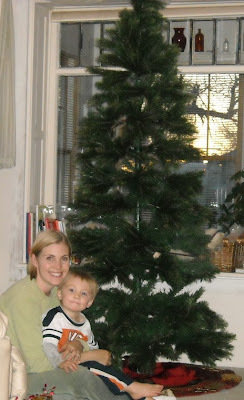 The three-present rule was just one of the goldmines I found in A Recipe for Christmas Joy! Although I grew up in the Midwest, I’m a Southern cook at heart :). 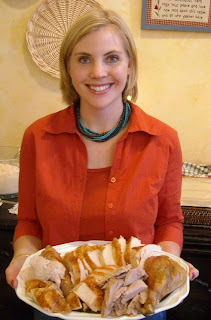 Marybeth has included pages of delicious holiday and anytime recipes: Tarheel pie, pumpkin bread (that makes three loaves at once), pumpkin crisp, cornbread dressing, corn pudding, slow cooker apple butter, our favorite pork roast recipe, even how to cook a turkey in the Crock-pot! Plus there’s a whole list of easy meal ideas for busy nights. Marybeth generously agreed to bless one lucky reader with a copy of A Recipe for Christmas Joy! To be entered to win, please leave a comment at this post, and I’ll draw a winner on Monday! Visit Frugal Friday for more money-saving ideas! “I don’t have much,” Laura says to Mary as they’re counting their coins. “Neither do I,” Mary says. “It’s got to be special,” Mary says. So they set out to make handmade gifts for Christmas. They each gave one gift to a chosen member of their family. Do you see the Ingalls or their children acting pouty and slighted that they only received one gift total from all their family members? Quite the contrary. Fewer gifts meant they cherished what they were given much more than if they received a multitude. I think there’s much to emulate about their attitudes and approach to Christmas. Making handmade gifts for Christmas is special, often practical, usually frugal, and always an expression of love. But it takes time. Christmas is a exactly five weeks away. So if you’re going to create a handmade gift, how do you find time to get it done? 1. In Christmas at Plum Creek, the Ingalls had time to get their projects done because they were only working on one gift each. Keep it simple. If you haven’t started by now, it is not the time to knit a scarf for Grandma, sew a quilt for Mom, make a dress for your daughter, decorate a wooden jewelry box for your sister, and sculpt a mug on the pottery wheel for your husband. Pick one thing…or a few very doable things. 2. Be intentional about setting aside time to work on the project(s) each day. It doesn’t have to be much—15 minutes a day for several days will likely ensure your gift is ready to go under the tree. 3. As you’re carving out time to work on handmade projects, you’ll have to eliminate other activities that would normally fill your free time. 4. If you can't find time in your regular day to do your projects, extra time can be found by getting up early during this season, or staying up late, as the Ingalls did in the Little House episode Christmas at Plum Creek. 5. Avoid getting too frazzled and worked up about getting gifts made in time—remember why we’re making and giving gifts in the first place, and let love rule all you do. What was in her package? Remembering that Pa had told that Jesus is the true Christmas star, Carrie used her only penny to buy the shining star she set her eye on in the Olesen’s Mercantile. The key to a spectacular Christmas season of celebration is focusing on the true Star of Christmas, Christ Himself. While we work hard to make our gifts (or shop for them), we do well to remember the real meaning is not in giving and receiving gifts, but in focusing on the Giver of all gifts. It is out of this overflowing gratitude over what Christ has done for us that we find the desire to give gifts to those we love. We can get caught up in materialism over finding many gifts, or we can take the simpler--and perhaps more meaningful approach—of finding (or making) one special gift. This is so counter-cultural now that many people may feel a slight sting over only receiving one gift at Christmas, but one gift was good enough for the Ingalls and should be more than enough for us today too. Christmas is really not about us anyway. Christ already gave us the best gift we could ever ask for, much more than we deserve. Eternal life in Him is a gift that keeps on giving and can never be used up. We’ll talk about more ideas for a simple, spectacular Christmas on Coffee Talk Thursday. Today is a special day--my anniversary. 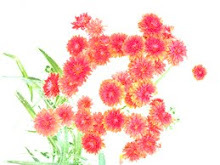 Traditional gifts for the 7th anniversary are copper or wool. My wonderful husband surprised me with this beautiful copper tea kettle. Isn't it so shiny? :) The tea cups you see are my great find for the day: Danish Blue Eschenbach china. On a little walk with my boys to the corner thrift store today, I found this box of china with five plates, nine cups, ten saucers, and eight small bowls...for $5! I swooped it up (not literally, though...after all, I was wearing my baby in the Ergo carrier!). Use your tea time to offer hospitality. Who can you invite over to share a cup of tea? I promise they'll be so blessed by your hospitality, encouragement, and interest in them (and their children) that they won't even notice (or care, if they do notice) that your house may not look like a page straight out of a Martha Stewart magazine. When I was in college, I spent a semester in London, living and studying at a theological seminary which was once a grand mansion. Everyday, without fail, at 10 and at 3 (I believe), everyone stopped for tea time. We all gathered in the beautiful dining room overlooking a rolling hill several sheep grazed on and shared fellowship over cups of tea. 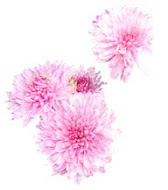 It always left us feeling invigorated, revived and ready to tackle the rest of the day. A warm cup of tea can minister to us on so many different levels. It's warm and soothing for our spirits, calming for our nerves, restful for our bodies, and relaxing for our minds. Taking time for tea also provides time for sharing among friends (or with our children), which kindles friendship and goodwill. No one has ever finished a cup of tea and felt to be in a worse mood than before sitting down for tea time. Today I'm grateful for my new tea kettle and dainty cups. I'll be having tea with my boys at three. May I encourage you to take time for tea today too? It's a Wonderful (Imperfect) Life Give-Away Winner! Thanks for sharing your thoughts on the It's a Wonderful (Imperfect) Life post! I enjoyed hearing from you! The winner of the book is: anonymous, with the email address: thejoyofthelord. I've sent you an email. I need to get your mailing address asap please. We have another great give-away coming up later this week, focusing on a recipe for Christmas joy! 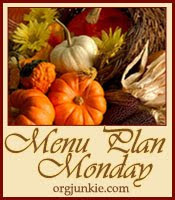 Did you perfectly execute last week's menu plan? I didn't either :) I never baked most of what I intended to--I'll try again this week! But by and large, having a menu plan--even when you veer from it--is still much more helpful than not having one and having to come up with meal ideas, say, 15 minutes before meal time! Here's what we might probably will be eating this week! Don't forget--there's still time to enter the drawing for the It's a Wonderful (Imperfect) Life giveaway! I'll draw Monday afternoon. It’s so funny how people can define clean (and messy) so differently. To one, clean means the absence of clutter—even if those perfectly clear surfaces haven’t been sprayed, scrubbed, vacuumed or wiped with a cleaning solution for awhile. To another, clean may not mean the absence of clutter but that surfaces and floors are “clean”: scrubbed and disinfected, floors swept and vacuumed--even if clutter abounds. Messy can be defined differently as well. A very “clean” (absence of clutter) person thinks of messy as even one or two things out of place. Those of us who are quite “messy” may tolerate a reasonable amount of clutter most of the time, but we still have a line where we know we’ve crossed over into “messy” territory and need to clean it up. How we define the situation in our homes depends much on our operating definitions of clean and messy. Harmony in marriage involves finding out your spouse’s definition of clean and trying hard to achieve it most of the time. When we fail, we should extend each other much grace and remember “love covers over a multitude of sins” (1 Peter4:8). To see some real life examples of differences in definitions, let’s look at some pictures! My friend, let's call her Jane, is impeccably neat and organized. She thinks her kitchen is messy. I would just say this is a normal kitchen after a meal, and I know my friend will have this cleaned up in mere minutes. So how we feel about the appearance of our home is largely determined by our definitions of clean and messy. I could walk into my friend's house, even on what she thinks is her messiest day, and still feel like it’s immaculate compared to my home (and my definition of messy). I can think my house is clean, and my husband can come home and think it’s messy (because of his definition). He doesn’t care if the counters are "clean" if he can't easily set anything down on them. (If I clear it to scrub it, why doesn't it stay clear? Good question). The other tip I would like to point out is to set a time-limit to our “messes.” Some clutter is unavoidable throughout the course of a day. My friend's table with homeschool books covering it is just a natural part of a homeschool day. These “messes” are not a problem as long as they resolve themselves when the situation that necessitated them is over. The problem comes into play when they are allowed to stay. My house stays looking messy because the messes rarely have an expiration date. When we get to that point, and we don’t know where to start, taking pictures is helpful. Although we can see clutter all over a surface, we see it so often that we don’t really “see” it anymore. Somehow seeing it in a picture helps direct our eyes to exactly what we need to take care of immediately. I found taking a picture of my counter provided much needed direction. So if you’re in need of mercy in this area, grab your camera, take a picture, look at it closely, and see what most catches your eye. You can post it on your blog and share about it here if you want to, but you certainly don’t have to if you don't want to! It's a Wonderful (Imperfect) Life.... And a Give-Away! As I mentioned yesterday, I was invited to be part of a blog tour for the book It's A Wonderful Imperfect Life: Daily Encouragement for Women Who Strive Too Hard to Make It Just Right . Joan C. Webb is a international speaker and life coach who shares a message of freedom from perfectionism and renewal to relax and enjoy life as God has designed. Isaiah 42:3: A bruised reed he will not break. Yet, I remind her, a seven-year-old car that breaks down, a child who contracts chicken pox, a washer that malfunctions and overflows merely reveal the inevitable consequences of living in an imperfect world. These things just happen—sometimes they’re spread over several months; other times they happen in one day! God doesn't mistreat his children. When we hurt financially, emotionally, physically, or spiritually, he cares. He sent his Son to prove just how much. Lord, how comforting to know that you won’t crush me when I’m weak and needy. In The Message, Eugene Peterson paraphrased Isaiah 42:3: “He won’t brush aside the bruised and the hurt.” When have you felt like a “bruised reed? God gives us much mercy and grace for each day. He isn’t expecting perfection out of us. He leads us gently and desires that we, too, gently lead our young. If we could free ourselves from the expectation of perfection and just get to the place where we can relax and know it’s ok as seemingly imperfect as it is, we would find more peace in our spirits on a day-to-day basis. A bubble bath for the soul. Sounds good to me! Here are some questions Joan answered that I thought would be helpful for us to think through. Q: If you could go back and give your young-mom-self one piece of advice, what would it be? A: Hmmm. When I remember the “zombie” days of babies, toddlers and endless activities, I think I’d say: ask for the help you need and release yourself from doing it all, even if someone else pushes you. Okay, one more thing: your kids don’t have to be perfect. What is perfect, anyway? Each one has a unique personality with different needs, desires and talents. Allow yourself, your mate and your child to make mistakes. Yet, without a doubt, the single most important and loving thing you can do for your children is to deal with your own past pain and current problems, and grow yourself spiritually and emotionally. Of course, this includes growing your relationship with Jesus. So I’d suggest that a new mom put the book by her rocking chair to read one devo at a time as she nurses or holds her baby. Another woman might keep the book with her Bible and read one story a day. Another might keep the devo book in the bathroom and read one every once in a while when she gets some private time. Another could tuck it into her briefcase and skim a devo during lunch hour. Two women might make a pact to read a devo a week and then discuss it together on the phone on in an email. Just have fun with them and chuckle at her new journey. 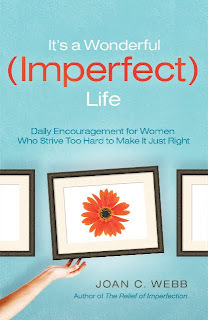 If you would like your own copy of It's A Wonderful Imperfect Life: Daily Encouragement for Women Who Strive Too Hard to Make It Just Right , good news! We have a copy to give away to one lucky reader! To enter, just leave a comment on this post (be sure to leave a way to contact you if you win), and I will draw and post the winner Monday. You can read another devotional from the book on November 14 at Giving Up On Perfect, and you can also see all the stops at the tour schedule. Can anyone of us truly say we feel completely confident in what we’re doing as mothers 100% of the time? I sure can’t. I am very introspective, almost always trying to improve myself in a myriad of areas, and I tend to second-guess myself internally just about all day long (well, maybe that’s a bit exaggerated…). From sunrise to sunset, I wonder if I’m doing things right. If we had careers prior to motherhood, there was a learning curve to our jobs. I worked in broadcast news, first as a reporter, and then as an anchor. Once I got the learning curve down, I did a pretty good job. I’m sure we can all say that, since we handpicked our careers based on our natural giftedness and what we enjoy. With motherhood, however, the learning curve never ends. That’s part of the reason it truly is the hardest job in the world—because you can never fully master it. Is it possible to find the place where the second-guessing doesn’t exist anymore—where motherhood becomes almost easy? Or are we mistaken to expect that from our journeys? Is motherhood naturally going to be a bit bumpy at times as we figure out the kinks of each stage (and there’s always a new stage just when you get the last one somewhat figured out)? Maybe we need to stop searching for the magic pot of gold at the end of the rainbow where we get our “ah-ha” moment and feel like we’ve finally found all the answers--the perfect way to go about each day—where we never wonder if we’re doing everything right anymore. Maybe we just need to stop striving so hard and realize that, in addition to all the joys of motherhood, we just need a good helping of endurance. Every single day. I hope that this encourages you, as it did me when I reflected on all this. God doesn’t expect us to be perfect. He gives us the grace each day to do the best job we can in the homes He’s given us. He knows everything about each of us and handpicked us to mother the children He’s given us. Just do the very best you can do today, and pray for confidence to go about your day without second-guessing yourself and your decisions. “…To accept his lot and be happy in his work—this is a gift from God” (Ecc. 6:19b). This brings me to a giveaway announcement! Tomorrow I'm participating in a blog tour and have a copy to give away of It's A Wonderful Imperfect Life: Daily Encouragement for Women Who Strive Too Hard to Make It Just Right . Hope to see you then! My boys are never ever coming to the grocery store with me again until they're about 30, and then they won't want to go to the grocery store with me; but if they did, I would run up and down several aisles, crawl on my belly by the milk, and even plop down on top of the bags of ice in the freezer while they're at the checkout counter, paying for their groceries and attempting to save face. Then they could finally experience how I felt today when they did those exact things. The crawling in the ice freezer was indeed the culmination of this down-in-the-record-books trip. I removed them and headed to the door where the nice teen employee was waiting for me with my cart of groceries, thinking to herself, "This woman really needs to discipline her kids. When I have kids, mine will never do that." As we were on our way out (the exit never looked so good), my oldest son decided to go back for seconds (he must have been hot from all that running). As I was waiting for him to come out of the freezer (only about 20 seconds, don't worry)--trying to figure out if reality discipline or old fashioned discipline would be most effective--a woman walked over from her checkout line and let him out. She cast me a not-so-nice glance, as if I needed the extra effect. Trust me, the "get a clue" glare did not tell me anything I didn't already know. When we got home, we had a long talk about appropriate and inappropriate behavior, and why inappropriate behavior does not honor our family, other people, and the Lord. The boys also received some practical reminders to help them remember this lesson next time around (yes, I'm talking about what you think I'm talking about). :) I am slowly getting over my humiliation and anger about the whole ordeal. Being the introspective mom in need of mercy that I am, I'm trying to find the lessons in all of this. One, don't take your kids to the store with you until they're way past maturity. So that's not practical, let's try again. I should have left the store when they first started misbehaving. I have said that before. I've never followed through, though, because it's really not very convenient. You've gone to the store with your kids because you need to get something; you at least want to get the something you came for. I guess you could take the kids out to the car, strap them in their car seats and lock them in while you run in the store for a moment, but in many states, this is technically illegal. My husband has suggested that I take the boys with me for nothing else than a training session. Don't plan to get any groceries, just plan to practice behaving properly in the store and/or leaving the store. As moms, our job is to provide constant training for our children. As embarrassing as it was, today's shopping excursion was indeed a training experience. I certainly hope they will behave better next time, when they're 30 and we go to the store together again :) It would be nice if we could train them once and never have to go back to the same lessons again, but that's just not the way it works. So we need patience. Lots of it. A sense of humor really helps. At the time it wasn't funny. It's not terribly funny to me now, because I'm still seeing a few shades of red; but I can see how I could eventually think their climbing on top of bags of ice in the freezer, shutting the door, and waiting there for me was a little bit funny--especially when they were talking about how much fun that was after we left. We have to keep our eyes fixed on the big picture. Otherwise these bumps in the road will seem bigger than they really are and will ruin our whole outlook on what we're really trying to achieve. So while the checkout counter with kids in tow (or not very well in tow) may indeed be stressful, we must remember the goal we're aiming toward: we want (I hope!) our kids to develop a solid faith in Christ and a close relationship with Him as their Lord. Our part in helping this come about is to train, to teach, and to model for our children the difference a relationship with Christ makes in our own lives. Angry attitudes and harsh words over childish behavior, however inappropriate, do not paint the picture of why following Jesus is desirable and makes a difference in our day-to-day lives. Today I'm grateful for these reminders. My kids fell short; I fell short too. If we're honest, we all do, many times a day. That's why God's grace and mercy is so restorative. A fresh start for a new day ahead. May His grace be with us all, especially at the grocery store. Leftover baked spaghetti (so easy! Take leftover noodles, thin down your sauce with water if you don't have much sauce left; put it in a casserole dish, top with cottage cheese and sour cream (mixed together in equal amounts, between 1/2 and 1c. depending on the size of your casserole), you can mix in 1 can of green chiles if you want, top with cheddar cheese, sprinkle with parmesan cheese, bake at 350 for about 30 minutes...a great way to use up spaghetti leftovers!) and bread--have to make it! Wherever I look, there is at least one—usually more—piece of clothing lying somewhere in my house. It’s either waiting to be washed, waiting to be folded, waiting to be put away, waiting to be stored away, waiting to be given away—clothes everywhere, lying in wait. You can put them in drawers, hang them in closets, stuff them in hampers, and somehow they still end up in places they shouldn’t be. Couple the vagrant clothing phenomenon with the fact that my kids simply have way too many clothes and it’s no wonder why I’m constantly drowning in a sea of 0-5T. So how do we get a handle on the clothes that continually clutter our minds and lives? (plus maybe some sweats and a sweater or two). I have, and I save, much more than that, though. Why? Probably because I have three very active boys, and I feel like some of the clothes will wear out before they get handed down, so I should save more than I currently need to have “more options” each time around. But the problem only keeps growing as we receive more hand-me-downs and new clothing gifts. Reducing inventory also involves being willing to part with sentimental memories. “How can I get rid of this sleeper when it reminds me of bringing my baby home from the hospital?” I have pictures of my boys wearing their special clothes; why do I need to save the actual piece of clothing? (I would still save their coming home outfits, just in a special place). About throwing clothes away, I find it incredibly difficult to trash any piece of clothing that isn’t loudly screaming “I’m done!” But recently, I took some clothes to the thrift store. Their dumpster overflowed with heaps and heaps of unwanted clothing, and they refused to take any more clothing donations. You could send them overseas if you knew an organization that could get them to children in need; but a Veteran told me many times, the governments of those countries keep the clothes and sell the fabric to the impoverished people. So what’s a mom to do? Buy sparingly, use wisely, and pass it on when you’re done, or throw it away if it’s done. If you still can’t bear to toss something, you could also repurpose a shirt as a cleaning rag. Keep up with what you’ve got. Well, I need to send some clothes packing. But what if my two year old wants the Pooh and Tigger shirt a year from now that I gave away today? Maybe I should keep it just in case? Now you're catching a glimpse of my dilemma :) In all seriousness, what they don't know won't hurt them. And you'll feel so much better having clothing clutter under control. Visit Frugal Fridays for more helpful ideas! How fun is this?! 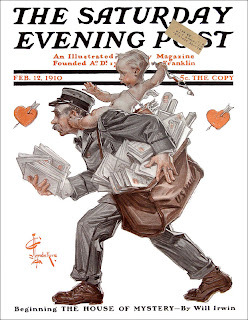 Remember the old Saturday Evening Posts? I bought one when I was a young preteen, because Katie Couric was on the cover, and I wanted to be a journalist just like her when I grew up. (Now, Katie and I are on different sides of the political spectrum, and I left news to become a full-time mom, but I digress). Well I just stumbled upon Elizabeth Esther's blog, where she hosts a monthly Saturday Evening Blog post. You can link up with your favorite post from the past month. I chose this one: How My Last Dollar Turned Into Much More. If you have a blog and want to link up a favorite October post, or want to read some other great posts, head on over! My baby just turned one. It seems like only yesterday I was in the hospital, meeting my baby face-to-face for the first time. As you think about your children’s “birth day” stories, I’m sure you can recall this day with vivid clarity too. Are these stories in your head, or are they written on paper to be preserved? A friend of mine inspired me by telling me she writes down the story of how each of her children came into the world (well, not that part!). She details the day of their birth and recounts it with them each year on their birthday. What a neat idea! You don’t have to be a great writer to do this. Just write down all that you can remember about the day. If you had a c-section (or a complication) and were too groggy to remember some details or not present for parts of your baby’s first day, you can ask those who were there to help fill in any gaps for you. The pain medication wore off and your head was turned the wrong way.